I can’t quite remember when brunch became quite such a fashionable weekend occupation. Breakfast food tends to not quite be my thing, my girlfriend however is a fan which is why I have found myself indulging over the last few weeks. I had particularly been badgered about visiting Toast, not to be confused with the Toast Bar at the National Videogame Arcade in Hockley. Instead it is a small café / deli on Derby Road, roughly opposite the Walton Hotel. The sort of place that does a lot of its trade from the Park Estate and where you imagine the word artisan passes lips with great regularity. One of the main advantages to a brunch is that you can get the range of breakfast dishes with a range of embellishments. 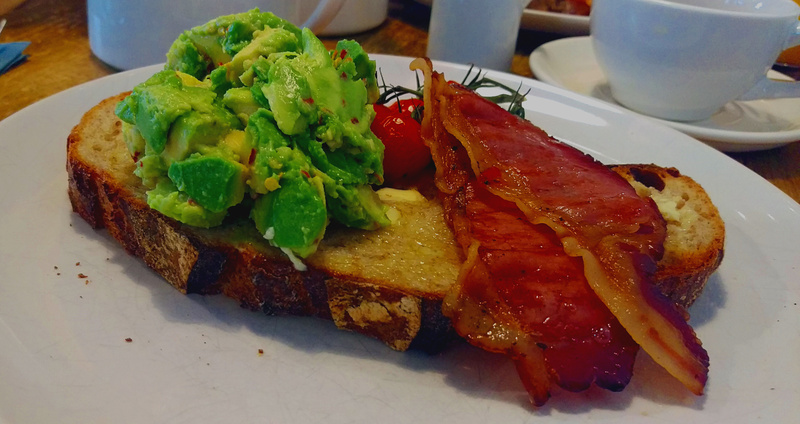 One of the foremost of these is the avocado, which alongside brunch must be one of the food success stories of the last few years. Maybe halloumi too, rubbery cheese..who saw that coming? Between us we had a gourmet full English as well as “smashed” avocado and bacon. Welbeck Sourdough was a staple across their menu and provided a good base to the dishes, the only downside the serious crust that tests our cutting skills. Mine was topped with a healthy mound of the green stuff as well as good quality tomatoes alongside. Bacon was quality too from the legendary JT Beedham, a little more cooked than I like it but that’s personal preference. Service was passable, I popped up to the counter to get served though I believe they should be coming to your table. The only real criticism here might be the price, my food coming in at £8. Overall 2 teas, a juice and our food was £24. Not extortionate for the quality on offer but up there with the more expensive breakfasts / brunches around. I recently also visited Bar Iberico on a lazy Sunday morning. I had good things to say about their evening menu but the early hours of the day bring a very different menu. Many of the options are flatbreads and at no more than £4 each we decided to order 2 of these and another breakfast dish. 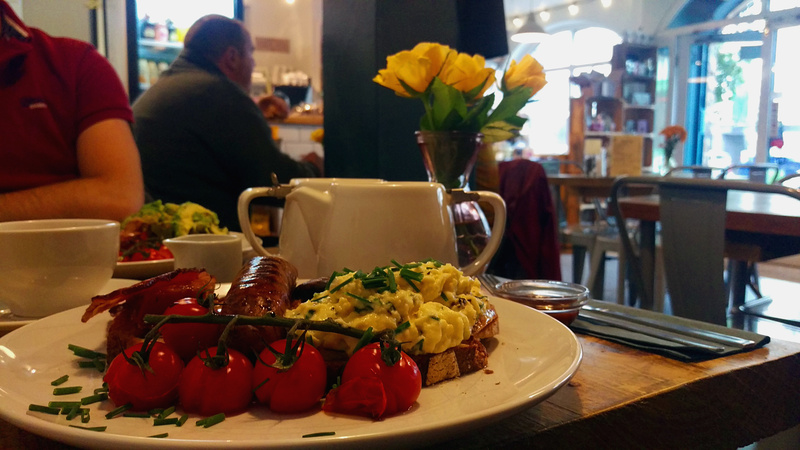 Mine was topped with Morcilla, scrambled egg and chorizo relish. An excellent marriage of flavours, the richness and subtle spice of the Morcilla sausage working well against the sweet, sticky relish. The only criticism would be that the ratio of bread to its topping was a little on the doughy side. 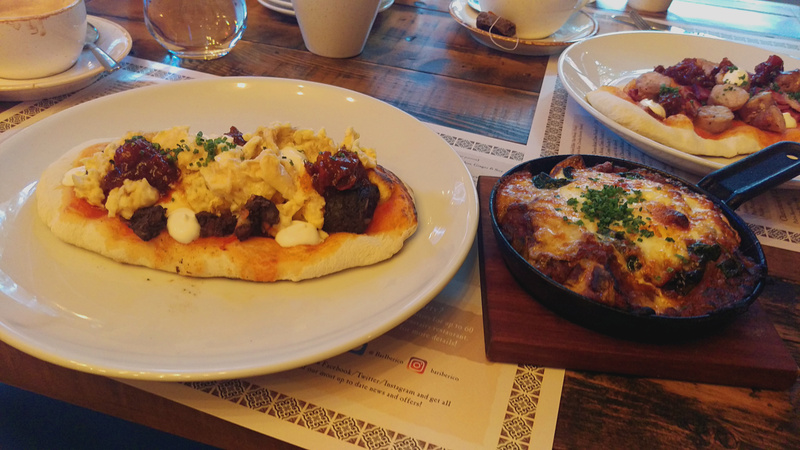 The non-flatbread dish we had was a little more brunchy than what had come before. A skillet was a Mediterranean take on baked eggs. Samfaina (a sort of Spanish ratatouille), spinach and goats cheese were a literal melting pot of flavours. Despite the reasonable price of the dishes we definitely didn’t need 3. That means you can have your breakfast and drink of choice here for £6/7. I struggle to think of where you could get better value.